Appropri8 make theatre that engages with the city, telling stories related to place, occupying sites and taking audiences on a journey through them. Our premise is that theatre can exist everywhere - in hidden, abandoned and forgotten spaces and that taken out of its formal setting, theatre can potentially reach new audiences. Artistic Director Sarah is an actor and architect with a passion for film and theatre making. She trained as an architect at the Architectural Association and as an actor at Drama Centre, Central St Martins. Appropri8 is intended to unite these passions. Appropri8's inaugural piece 'Urban Histories' was first performed with Nadine and Veronica, whom She met at Drama Centre. 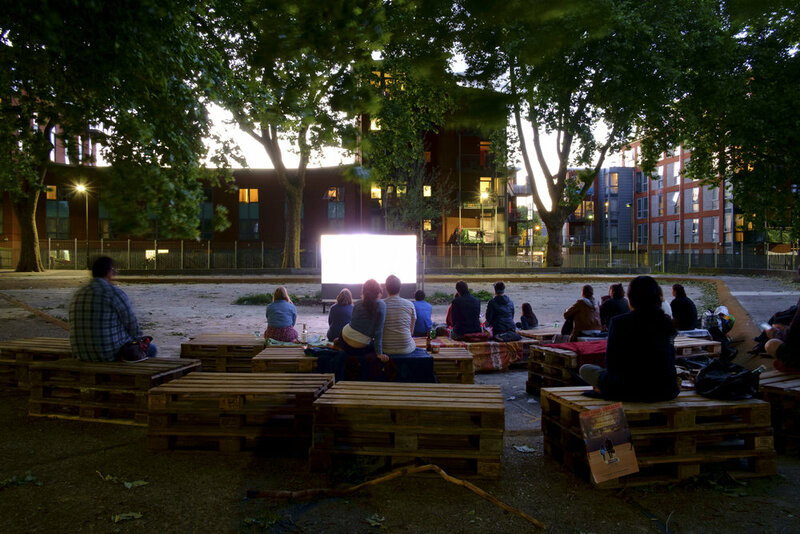 Cine-Theatre 1 transformed the site of the Old Paddling Pool at Millfields Park into a dual function pop-up; a cinema and open air theatre for, a day during the month of June 2017. The Old Paddling pool, which has been disused for several years, has an amphitheatre like quality which lends itself to the creation of a stage. The idea was to host to the work of local filmmakers and performers and create a place where the diverse, Clapton community could engage in a shared experience. We hope to return in 2018 with an expanded programme. The Cine at the Old Paddling Pool is viewed as a testbed project for a process that could be rolled out across various sites in London. 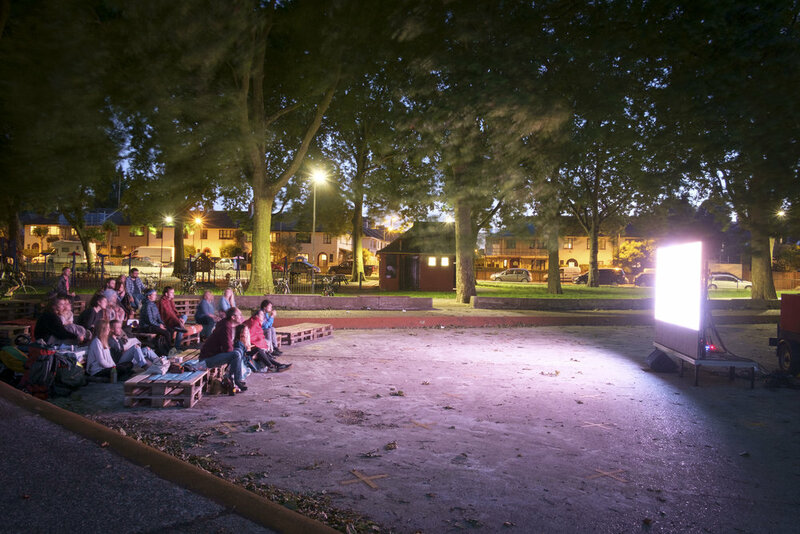 The Cini-Theatre is envisaged as an installation which will transform the site of the Old Paddling Pool at Millfields Park into a dual function pop-up; a cinema and open air theatre for, a day during the month of June. The Old Paddling pool, which has been disused for several years, already has an amphitheatre like quality which lends itself to the creation of a stage. It is intended to make a place that will play host to the work of local filmmakers and performers and be somewhere the diverse, Clapton community can engage in a shared experience. The Cini at the Old Paddling Pool will be a testbed project for a process that could be rolled out across various sites in London. In association with 'We Shall Not Be Moved' curated by Eva Freeman at Rara. An installation and performance, entitled 'House' in its' first incarnation at The London Festival of Architecture 2015. Urban Histories was a collaboration between Studio Aki and Appropri8 Theatre. It was inspired by a renovation in Stoke Newington. The first incarnation of the project too place at RARA Studios. In the process of renovating a house, as walls are stripped back, old coverings removed, holes knocked through stud and brick walls, a house’s past is hinted at in the layers uncovered; a fragment of 1970’s wallpaper, a victorian tile. These are clues give rise to the question, what lives have existed within these walls? Urban Histories seeks to explore these musings through series of vignettes. Visitors are invited into The House to meet past occupants and hear about fragments of their lives. We are delighted to announce, is that we were awarded £1000 from the Tesco Bags of Help fund. This is a fabulous initiative which sees all the 5ps gathered from plastic bag sales go toward local charities. We are particularly pleased because the award is voted for by local customers, so a big thank you to Tesco Hackney and its’ customers. On September 29th 2018 we will be taking over the The OlD Paddling Pool, On Millfield's Park and creating a theatre out of wood pallets. We are looking for actors to work on our piece ‘Hackney Stories’. Looking at the themes of migration, home and gentrification in the context of Britain just before Brexit, we what to explore the identity of Hackney and what makes it such a wonderfully diverse melting pot and the stories of how people came to live here. Last year we began collecting stories in a series of interviews which we will continue this year, with a view to developing a full production in 2019. This year we are performing short extracts & snippets…the story so far as part of our installation on Millfields Park and are seeking a diverse team to work with us. We still have one or to roles to fill and are looking for people with availability over the coming week. We are looking for adventurous physical performers and would also like to hear form Actor musicians, particuary drummers. Our Crowdfunding Video On Spacehive. Back Us Today! We will be taking over the Old Paddling Pool for a day in June and are looking for submissions from filmmakers and storytellers local to Hackney. 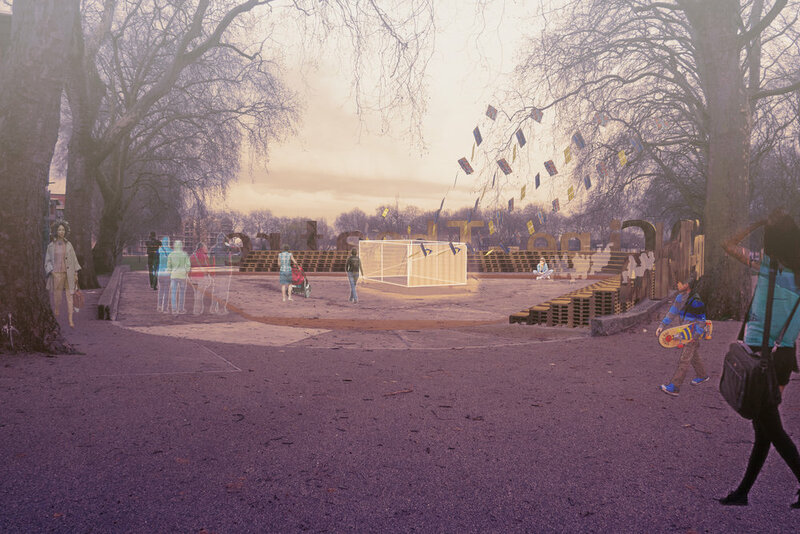 RT @studioaki: @LFArchitecture thanks we'll be transforming the Millfields site on August 28th. The man I am dubbing 'The Professor' is one of the most experienced shoe repair men I have ever met and proprietor of one the oldest surviving shoe repair shops in North-East London, which is situated on one of London's oldest terraces. He has been repairing shoes for years from this spot for 35 years and I have become increasingly curious about how this shop survives while Stoke Newington gentrifies around it. I was privileged to discover his story as I interviewed and photographed him for #hackneystories at . His story could be from the present day, he arrived aged 10, accompanied by his parents and siblings, fleeing war and hoping to start a new life. His father soon set up the business he now runs and like many others they became part of the rich texture of our city. Taking over from his father in the late 70s. Trained by his father a shoemaker, he has a passion for giving new life to shoes and is possibly one of the most experienced shoe repair men you will find in this part of town and his shop sits in own of the city's oldest terraces. Adam Bernstein has a love of food and London's history which are palpable within minutes of striking up a conversation with him. He has always loved to cook and his passion for traditional Jewish and London foods lead to the creation of Bernsteins Bar. We talked about Old Jewish London and the rag trade, the link between food and culture, the richness that waves of immigration have brought to London life, the pros and cons of gentrification and the tragedy of Brexit...On Monday I will be interviewing Adam's business partner Ben about the Antipodean side to the business...one of my favourite things in the world...Coffee! Remy is emphatically European, he ‘belongs to Europe’ and exudes an enthusiasm for London and Hackney that is infectious. His father a French Algerian moved to France in the fifties, prior to the country gaining it’s independence. There he met Remy’s French mother. From the age of thirty, Remy has travelled the world as part of his work, settling in Hackney in the mid noughties and, ten years ago, he set up L' Epicerie 56 to sell high quality food on Chatsworth Road. Entering the shop one is met by a rich array of produce, much of it is organic and fair trade, and of course it feels very European; shelves are stacked with wine, hand made cakes and chocolate fill the counter, cheese, sits behind and along with bread from a London based, French baker brings a subtle aroma of France to the shop. What does he love about Europe? It’s values, democracy, the sense of openness, the acts of leaders like Angela Merkel who welcomed migrants to Germany at a time of crisis. Yes, he is ‘proud to be European’ and feels that London is a city that suits him better than anywhere he has lived. He loves it’s diversity; the fact that you can sit in a pub and speak to people from Poland, Turkey, Australia…anywhere, and that his neighbours, though English, have Irish roots. It is ‘pleasant and challenging’ to learn to understand people from other places. And France, at the moment ? He is upset that thirty percent of France voted for Le Penn but is relieved that the tide of populism has, for now, been kept at bay. And so back to Hackney, living here since the mid 2000s means that he has seen the area gentrify, he is philosophical about this, it is sad to see old neighbours and patrons of his shop move away, something of the area’s texture is lost, like the guy who was ‘part of the folklore’ of his street, who used to fix old cars outside his house, he retired to Jamaica, taking the opportunity to sell his home, he is lost to the area; it is particularly sad if people are forced to move. Then there are long standing businesses such as coffee shop Copper and Wolf, squeezed out by rising rents, but Remy is also happy to welcome new neighbours, who come and make new lives, businesses and creating jobs here. So, ultimately, he is optimistic about the future here in this vibrant part of East London...next up Michele and Maria. 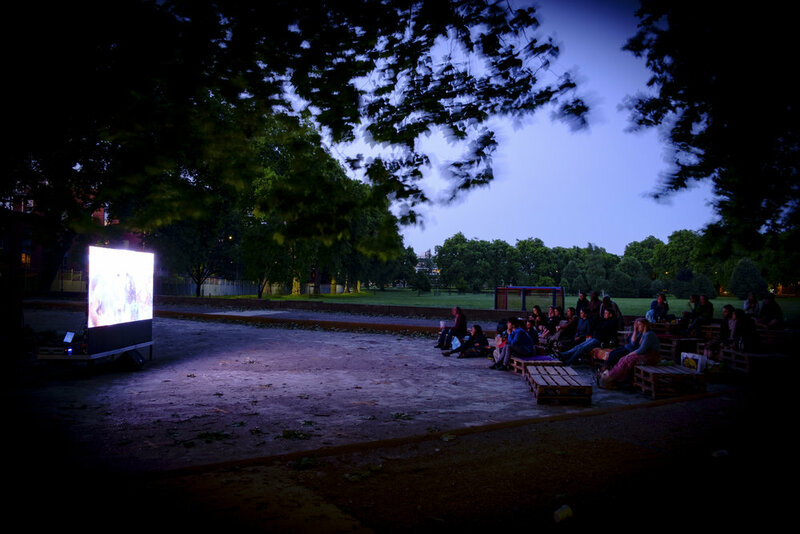 Cine-Theatre 1 transformed the site of the Old Paddling Pool at Millfields Park into a dual function pop-up; a cinema and open air theatre for, a day in the month of June 2017, as part of The London Festival of Architecture and now after winning funding from Tesco Hackney ad Groundworks we are back for Cine-Theatre 2018. The Old Paddling pool, which has been disused for several years, has an amphitheatre like quality which lends itself to the creation of a stage. The idea was to host to the work of local filmmakers and performers and create a place where the diverse, Clapton community could engage in a shared experience. We hope to return in 2018 with an expanded programme. The Cine at the Old Paddling Pool is viewed as a testbed project for a process that could be rolled out across various sites in London. Over the course of a day visitors will be invited to take part in a Community Build to create the stage. Support will be provided by Studio Aki, Rara and CoDb all of whom have experience in designing and building temporary structures. The intention is to pre-fabricate some elements in the Rara workshop to simplify the process once on site. Throughout the day artists and storytellers will be invited perform on the evolving theatre construction. 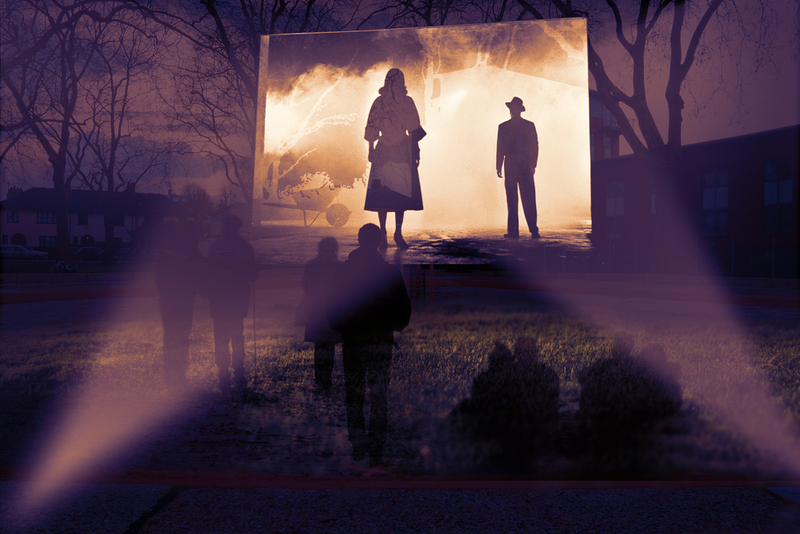 Short and Micro films from local filmmakers will be shown as it begins to get dark. Envisaged as an evening, which embraces the social tradition cinema, the big film will be an open air screening of a London classic.